Right now when you walk into the Gallery, you have Nike Savvas’s brightly fluttering Rally dazzling your receptors and the paintings of the Forcefields exhibition punching you in the visual cortex. But how do you get that sensation at home? 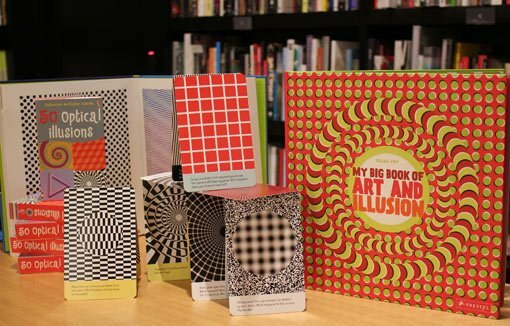 Never fear – these books from the Gallery Shop will make your eyes spin and your stomach flip-flop, with op art illusions, hidden pictures and digital designs that seem to vibrate off the page or twist your mental map in knots. 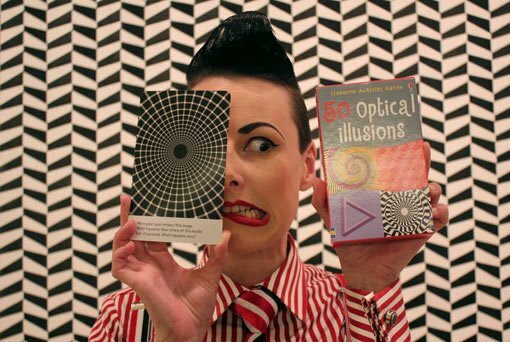 Illusion confusion explores a variety of ways that artists through the centuries have been causing viewers to double-take. Containing everything from Escher’s brain-benders to perspective puzzles like the Ames Room and the urban camouflage of Liu Bolin, this is a great book for the coffee table, particularly if you don’t want your guests’ undivided attention. It has masterful examples of trompe-l’oeil and the visual trickery of the theatre, along with landscape artworks that make the mind hurt trying to grasp their physical reality. For the younger set, there’s 13 art illusions children should know . The title might sound slightly alarmist (if you don’t tell them about these illusions, who will? The kids at school?) but the contents give a clear and engaging overview of different types of optical sleight-of-hand, as well as how they work and why we respond to them. My big book of art and illusion covers similar territory for kids in a larger format that better displays the detailed images, and also offers prompts for discussion and practical exercises. Usborne’s 50 optical illusions activity cards is a deck of eye-blistering patterns and impossible shapes, all with secrets explained on the reverse. One of the most enduringly popular items in our children’s section, the set comes with a revealer card so you can confirm the cunning techniques for yourself. We suggest sticking them on your wall in a glorious mural to stare at whenever you need a jolt to the nervous system! A final advisory: prolonged perusal of these collections may result in a magnificent sense of disorientation. You have been warned.